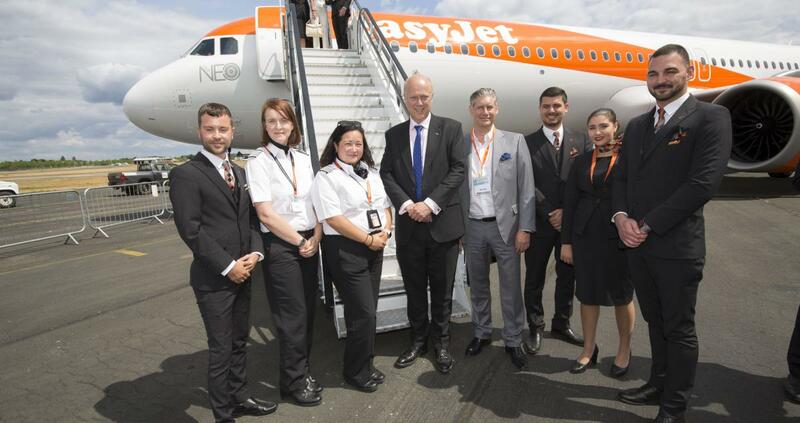 The low-cost airline easyJet took its first brand new Airbus A321neo to the Farnborough International Airshow last week, to show off the new bright bird. easyJet CEO Johan Lundgren was joined by UK Secretary of State for Transport Chris Grayling, Airbus CEO Tom Enders and President of CFM International Gaël Méheust at Farnborough to celebrate the delivery of the A321neo which - with a 235 seat configuration - is easyJet’s largest capacity aircraft now in its fleet. The aircraft was flown into the airshow by an all-female flight crew. Just over a year ago easyJet announced an agreement with Airbus to convert 30 existing A320neo orders to the A321neo aircraft with a 235-seat configuration, part of the existing easyJet Airbus agreement dating from 2013. The first easyJet A321neo is based at London Gatwick Airport and will fly to popular destinations such as Malaga, Alicante and Palma. The aircraft has around 30% more seats on board compared to an A320 and 50% when replacing an A319. Johan Lundgren, easyJet’s CEO said, “We are delighted to mark the delivery of our first A321neo aircraft today. This larger aircraft will enable us deliver our strategy of securing and growing our number one positions at Europe’s leading and slot-constrained airports. It will also provide easyJet with the lowest operating costs in the single-aisle aircraft category with unit cost savings which are estimated to be up to 9% better than an A320neo and around 21% better than an A319.